Our celebrity obsessed culture rabidly admires all things famous person related. This, of course, means movies, music, sports, and sponsored products. But do we love celebrity real estate? Oh, yes. Although we live in very different worlds, Military Serviceland or Celebrityville, we’re more like the famous than we think when it comes to house buying. Here are a few “must have” features celebrities hire real estate professionals to find, no matter in what city they are buying. Would you ask your agent to find any of these amenities? Probably so, just within a lower price range. Celebs like privacy. The more time they can stay at home working out and getting their hair and makeup done, the better. Paparazzi have a harder time accessing private property to grab unfortunate pics of mundane tasks. Gated properties with security to preserve seclusion are extremely desired. A home with space for a gourmet kitchen and, presumably, a highly sought after chef-in-residence. Workout or exercise rooms that rival commercial gyms. The house wouldn’t be complete without technology laden media/theater rooms. Dedicated space to run their celebrity empire must be available. Personalized and perfectly decorated offices are preferred. Closest and storage space have to be abundant. Homebuyers of all spending brackets demand storage, but imagine what kind of closet an actor might request. Entire rooms for housing outfits wouldn’t be out of the ordinary. Resort-style entertaining and guest spaces. Ample garage space for grown-up toys. MilitaryByOwner’s first "Home of the Week" doesn’t have a celebrity currently selling the place, but a revered San Antonio, Texas, custom home builder once called this property his very own. Check out this home on Hansen Greens, listed at $735,000. The pictures of this home speak a luxury language detailing amenities both celebrities and everyday people will admire. Just look at how many of the celebrity must-have boxes this home’s list checks! For starters, the chef’s kitchen has all of the expensive details buyers could ask for: high-end appliances, unique granite countertops, and two expansive pantries. This photo overlooking the pool into the back entertaining space of the house could easily fit into a feature in InStyle’s Home Tour. 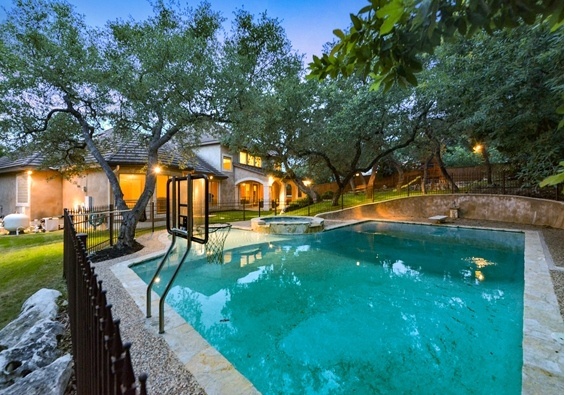 The heated pool is a private oasis for entertaining year round. Amazing light streams through this house, thanks to the numerous picture windows in every room. Other perks of this home: the community is gated with 24 hour guards, and the garage is equipped for three cars plus a lift for a fourth! If celebrity culture is your thing, San Antonio has its share of famous folks with ties to the area. It’s likely you’ll see or read about sightings of stars and athletes like country music’s great George Strait, actors Eva Longoria, Tommy Lee Jones, Armie Hammer, and Elizabeth Chambers. Toss in a healthy sprinkling of current and former San Antonio Spurs players, and all the celeb categories are covered. But most importantly to MilitaryByOwner readers, this home is located within driving distance of Randolph AFB, Lackland AFB, and Fort Sam Houston. Be sure to check out the rest of the brilliant photography this home has to show. 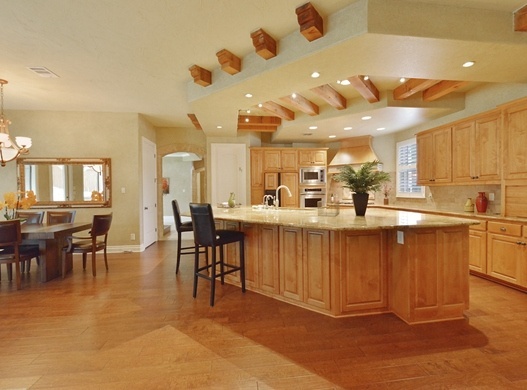 The pictures are a great example of what professional photography can do for your home sale! **Update: This MilitaryByOwner listing is no longer for sale. 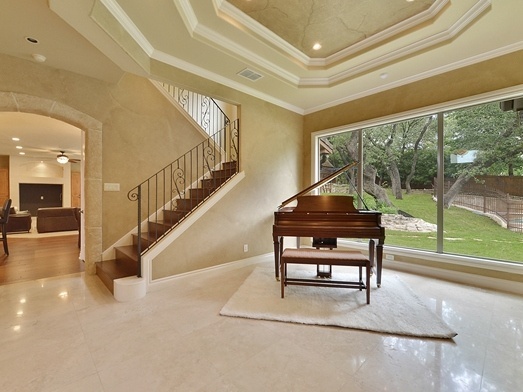 To view other beautiful homes in the San Antonio area for sale or rent, check out these listings on MilitaryByOwner!